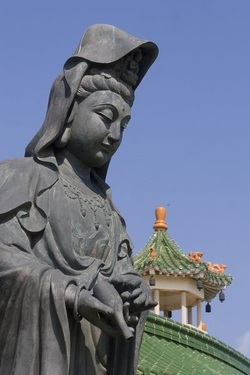 In 1992, the Bronkhorstspruit City Council donated 6 hectares of land to the Fo Guang Shan Buddhist Order to be developed into a Chinese Buddhist, Cultural, and Educational Complex. Ven. Master Hsing Yun sent one of his long-time disciples, Ven. Master Hui Li, to build the Nan Hua Temple in Bronkhorstspruit, to attain these goals and promote Buddhism on the African continent.Since then, the Nan Hua Temple Guesthouse, African Buddhist Seminary (ABS), Nan Hua Village, Assembly Hall , Zen Retreat Centre have been completed and are continuously being upgraded. The New Main Temple (right), which will be the ordination hall for African monks, is near completion. Our Buddhist community of resident monks and nuns, staff and lay people, both Chinese and non-Chinese, as well as the Buddhist Seminary novices help in a variety of religious, cultural, community and charitable activities. We also cultivate nearby farms. Nan Hua Temple has opened branches in other South African cities. promoting Bronkhorstspruit investment opportunities. Venerable Master Hsing Yun shared with Dr. Senekal his dream to build a Temple in Africa. A Temple and guesthouse in this area would also attract tourists and other business ventures. The natural beauty, room for growth and industries, available skilled labour, excellent infrastructure and its proximity to Johannesburg, Pretoria, Witbank and the Johannesburg International Airport were the deciding factors for choosing Bronkhorstspruit. After the meeting in 1991 planning started, and when design work was put onto paper and fundraising began. The dream started becoming reality. Both parties signed a contract in Taiwan on 8 March 1992, whereupon Bronkhorstspruit donated 14 hectares of land. Construction began in October 1992. 95% of the construction materials come from local sources in South Africa, including the Chinese style concrete castings of the first floor balcony handrail, which where made in Pretoria. The red wooden furniture, glazed clay roof tiles and ornaments were imported from Taiwan. The granite, stone, red clay and bronze ornaments, including the large bronze bell, came from China. Taiwanese artists executed the wall paintings on site. Since October 1993, we first erected a temporary office and temple. Then we built a Buddhist Seminary with classrooms and accommodation for about 150. Next we built the guesthouse, including adjacent garages, parking lots and lawns. 1. Propagate Dharma: Teach the methods of the Buddha so that people my leave suffering behind and gain joy, to bring true joy to the sentient beings of Africa. 2. Sangha liberation: Educate local people to be monastics, planting the seeds of the Bodhi Way (path of wisdom) in Africa. 3. Ordination: To pass down the Buddhas' precepts for liberation and give refuge to both monastics and laity. 4. Translation of scriptures: To translate the Chinese Tripitaka (scriptures) into local languages to let Africans also have access to them. 5. Construct temples: To construct temples for laity and montastics to live in and practice Buddhism and give sentient beings a place for learning and practicing the Dharma.